What do you do if you need a break from real writing (for money, you know) to organize your thoughts? If yer a spiritual layabout like me, you watch a trio of vintage Popeye cartoons from Fleischer Studios, claim it’s not only a break but research in another medium you critique, and get a cheap blog post out of it. The three I watched were from the second authorized installment of classic Fleischers, from 1938-1940, when the studio was supposedly in decline after a move to Miami (then little more than a tropical-temperature, backwater getaway for New Yorkers), yet I love almost all of these as much as earlier work. But “The Jeep” ain’t much of a cartoon — introduces the character, goes autopilot: “Popeye Presents Eugene the Jeep” (a kind of re-introduction) is far superior. 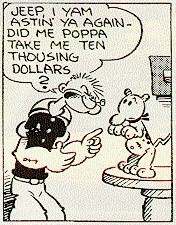 My second cartoon, however, “Goonland” (which introduced Poopdeck Pappy) is a flawless entertainment. This puts Popeye into a King Kong island situation again (like “Sinbad the Sailor”) where he has to rescue his salty-unto-hateful Pappy from captivity by the population of Goons. This has loads of visual kicks — Popeye making himself into a Goon, the destruction of the stone jail around Pappy, who then rescues Popeye from being crushed by a boulder in one of the supreme Twisker Punch moments — and not a duff bit of storytelling. I remembered each second from when I saw it as a child. My third revisit was the top treat for me. The Technicolor two-reeler “Aladdin and His Wonderful Lamp” in a print that was far, far better than any I ever saw on television. This is the least-well-regarded of the two-reelers, which may indeed have something to do with the villain being not Bluto but the Grand Vizier, never seen before or since in Popeye universe, and also with the Fleischers sliding deeper into an era when Disney dominated the longer-animation slot. Anyway, it’s a lovely-looking, crisply plotted animation that features a cartoon-gay Genie that clearly inspired Robin Williams (not to mention the Genie that interacted with Bugs Bunny in later cartoons). Plus Olive Oyl in one of her finest, most well-developed roles and the funniest (voice of Popeye) Jack Mercer improvisation ever — yes, the title of this blog post. *For one thing, if you look at the original Alice the Goon, who began comic-strip life as a muscle-creature for the Sea Hag, she’s a deeply hideous creation, worthy of Bosch (the way the close eyes and nose and no mouth work together is unforgettably eerie). Quietly, E.C. Segar was a tremendously powerful graphic artist. The cute Jeep was reportedly invented as an offset to the horror of the Goon, and even in the earliest cartoons, the monsters were toned down. This entry was posted in Animation, Comic Books/Graphic Novels, Films by milomiles. Bookmark the permalink.